2In a small sauce pan over medium heat boil the wine until reduced to half. Add the pomegranate juice and all the spices and simmer over low heat until liquid gets thicker as syrup, about 45 min. 5With a sharp knife score the skin side of the magret in a ½” crisscross pattern. Brush the duck breast with olive oil and generously season both sides of it with the rub mix. 6Place the breast skin side down on a heated heavy-bottom skillet. Over medium heat brown the magret, discarding the fat, until almost all fat is extracted, about 6-7 min. Once done, turn the magret over and place the skillet in the preheated oven. Cook until meat in the middle is rare, about 5 min. Let it rest for 10 min before slicing. 7To serve cut it thinly skin side up on a 45 degree angle. 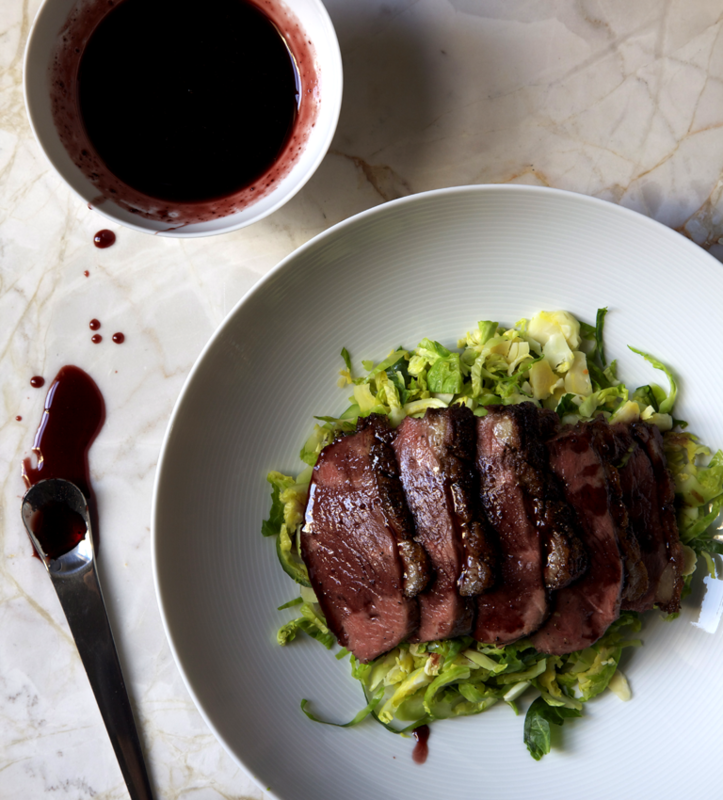 8Serve it over shredded Brussels sprouts with drizzled pomegranate syrup. 10Bring a pot of 5 cups salted water to a boil. Add all the Brussels sprouts and cook for 2 min. Once cold enough to handle, chop them finely.